NGA's "Mutual Aid Plan" is a document and process that guides the provision of aid to member utilities for emergency assistance in the form of personnel, supplies and/or equipment. NGA's Operations Emergency Mutual Assistance Plan (Plan) "provides guidelines to aid in maintaining or restoring gas utility service when such service has been disrupted by acts of the elements, equipment malfunctions, accidents, sabotage, or any other occurrences where the parties deem emergency assistance to be necessary or advisable." In the event that a company which is not a member of the NGA requires mutual assistance, the NGA Plan serves as the governing document for the duration of the emergency mutual assistance, unless a separate, specific agreement for the mutual aid is established between the companies involved. The NGA Mutual Aid program was heavily utilized in the fall of 2012 in the wake of Superstorm Sandy, which devastated major parts of the Northeast. The storm's impacts were wide-ranging, from transportation systems to energy. Over 2 million electric customers lost power in the Northeast, and there were major disruptions to the petroleum terminals and gasoline network, especially in the New York City metropolitan area and New Jersey. The impacts were also serious on the natural gas distribution system. 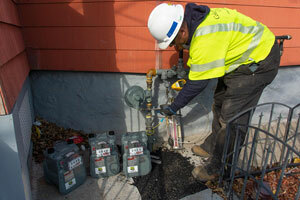 The number of customers whose natural gas distribution service was impacted in New Jersey, downstate New York and coastal Connecticut was an estimated 225,000. This storm represented the most extensive disruption to local natural gas distribution system service in the Northeast and one of the largest in the U.S. The two natural gas utilities with the most extensive damage in the Northeast requested mutual aid. NGA distributed the request to its member companies and to its fellow trade associations - AGA, SGA and the Canadian Gas Association (CGA). The response was prompt and positive. Even as most utilities in the Northeast had to deal first with impacts on their own systems, both gas and electric, they provided help where they could. In addition, crews from utilities in the U.S. also responded, as did crews from Canada. The work conditions were difficult, and housing for arriving crews was limited due to the storm's impact. Over 800 personnel were dispatched in all to assist, from about 50 companies, from the U.S. and Canada. Equipment was also provided to replace components damaged from flooding (especially service regulators). The process was utilized in fall 2018 when an explosion and fires on a natural gas distribution system affected service to three communities in Massachusetts. Utilities from around the region and the nation responded promptly to provide hundreds of service technicians to assist with checking and clearing all affected meters, disconnecting and reconnecting appliances, etc. The program was also called into service in January 2019 to assist in responding to two low pressure natural gas situations - one in Newport county, Rhode Island, and another in upstate New York. Again, hundreds of technicians responded to the mutual aid requests, to help turn off, and then relight, affected meters. The work continues, regionally and nationally, to improve mutual aid networks. NGA continues to work with other trade associations - such as the American Gas Association (AGA) and the Southern Gas Association (SGA) - on best practices and planning drills. "Mutual aid is a critical component in the utility industry, so we're always ready to lend a hand whenever we are able to. In addition to helping people in need, our employees gain important experience whenever we are able to assist another utility."